LAMP stands for Linux Apache MySQL Php/Python/Perl, which are the components of creating a web server. Previously, the acronym was used to remember which packages to install, but now we can install them all in one step. Open Terminal (A) and type the command to install “Task Select” (B). You will need to enter your password. Once the install is complete, run Task Select. The install will ask for a password for the “root” use of MySQL. Create and enter a password and confirm it on the next screen. When the installation is complete, the LAMP Web Server will be setup and running. Open a web browser and navigate to https://wordpress.org. 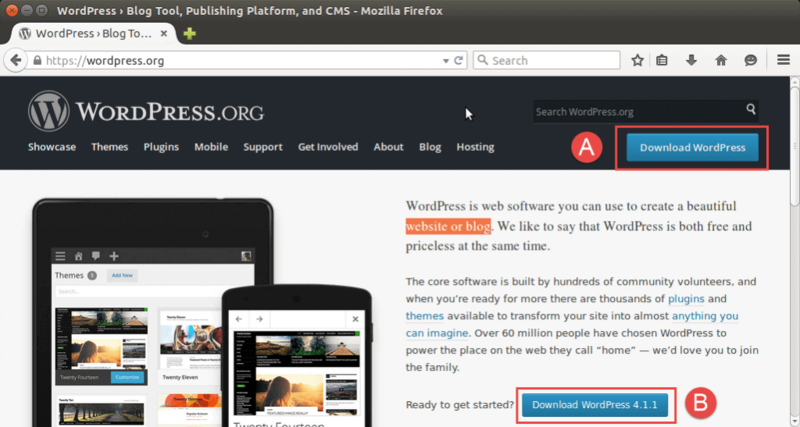 Click on the “Download WordPress” button (A) and then the “Download WordPress 4.1.1” button (B). NOTE: The number after “Download WordPress” may be different because of updated versions. 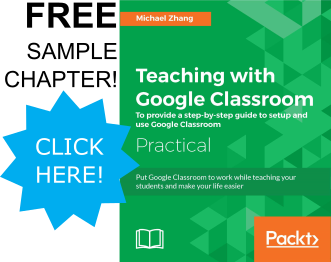 NOTE: This tutorial uses Firefox as the web browser. Select the “wordpress” folder (A) and extract the folder (B). 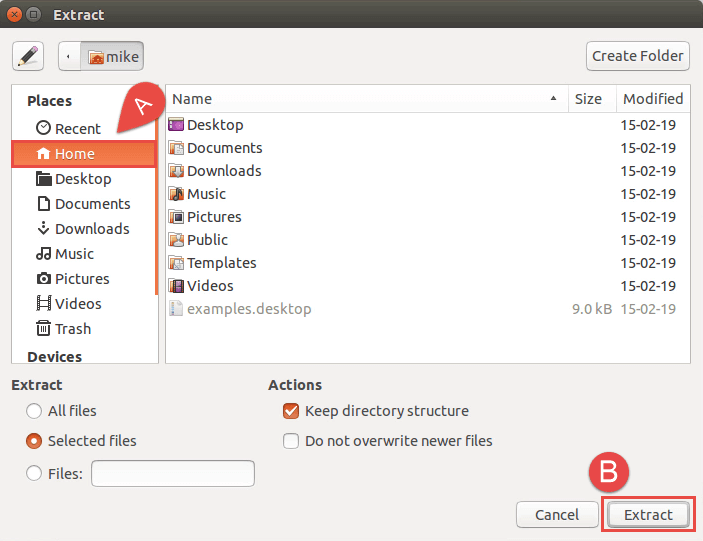 Choose the “Home” folder (A) as the location to extract the folder and click the “Extract” button (B). Return to (or Open) Terminal. 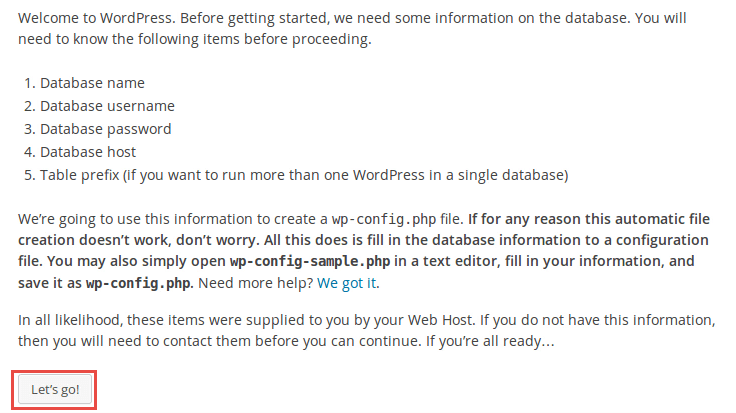 The following commands will first move the “wordpress” folder from the “Home” folder to the webserver location. In a web browser, navigate to the web address of your computer (click here if you missed the tutorial) but add “/wordpress” to the end of the address. 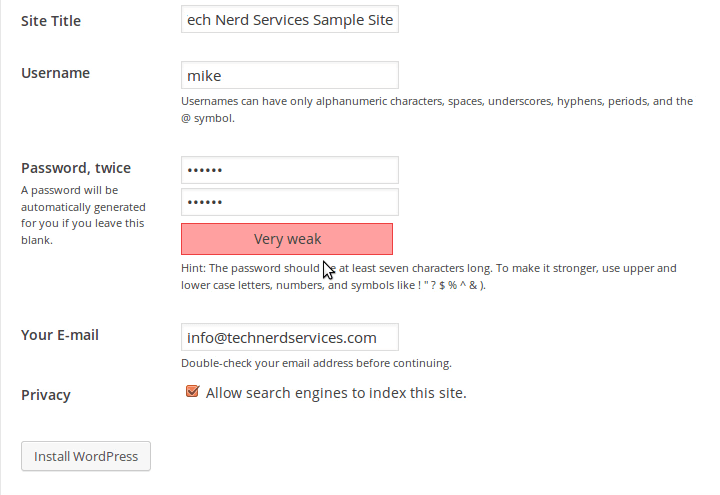 (For example, http://technerdservices.ddns.net/wordpress). Select your preferred language and click the “Continue” button. The following screen will display needed database information. Click “Let’s go!”. 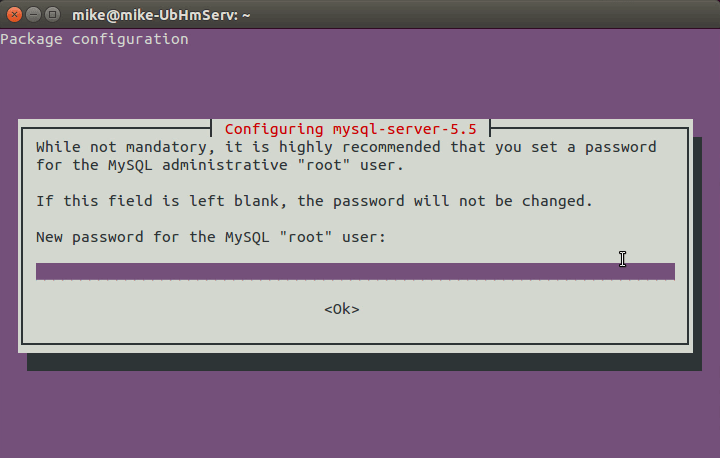 Return to (or Open) terminal and log into MySQL with the following command. You will need to enter the password created when installing the LAMP server. 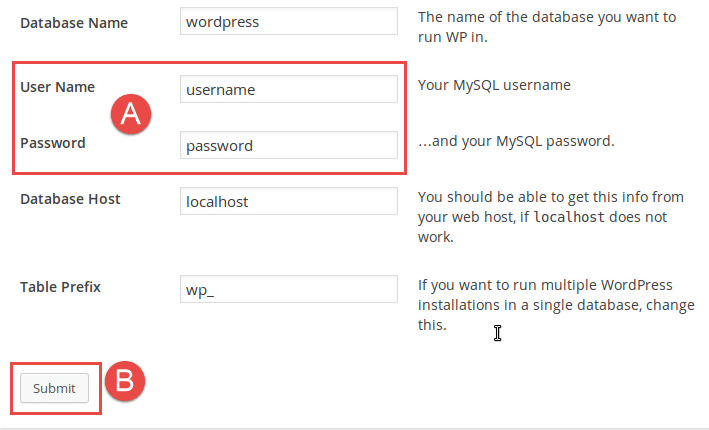 Create the database named “wordpress” (A). Exit MySQL by entering the “exit” command (B). 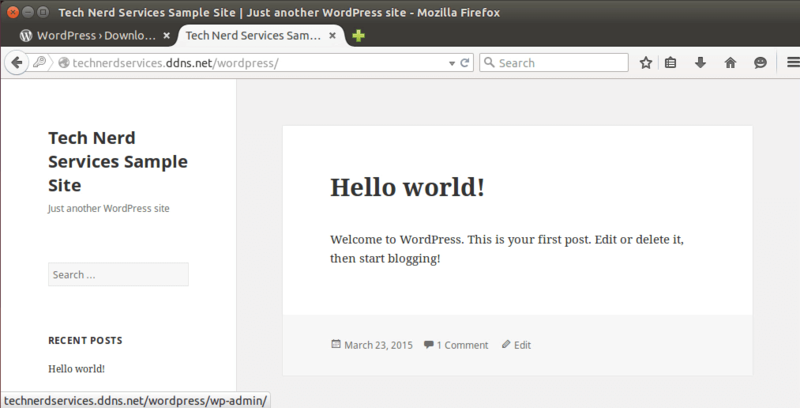 Return the the WordPress installation webpage. Type in “root” (no quotation marks) for the username and the password created when installing the LAMP server (A) and click the “Submit” button (B). (None of the other fields require changing). Click on the “Run the Install” button. 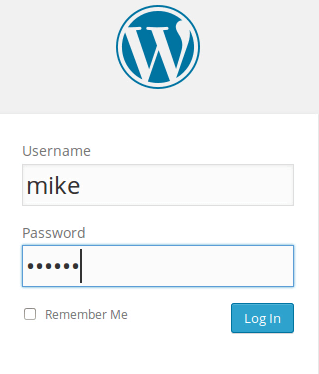 Add in your site information and create the first user account of WordPress. Then click the “Install WordPress” button. The next screen will confirm the installation. Click on the “Login” button. Congratulations! You have arrived at the WordPress site dashboard. 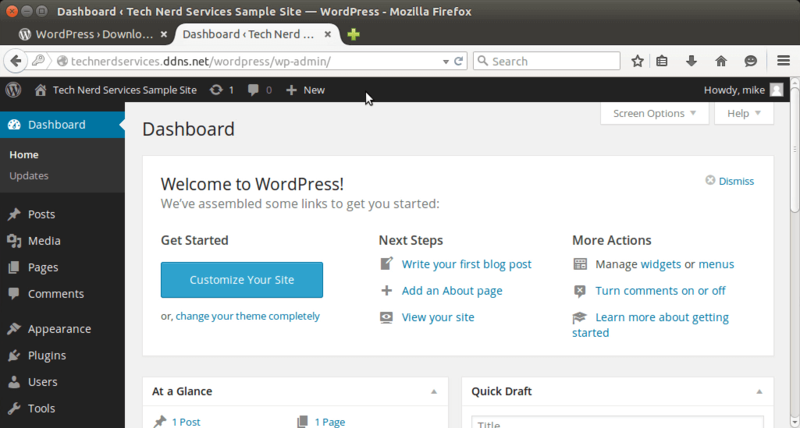 Click on the WordPress Site name in the header to view your site.